(Highly cited article from The Auk, July 2013)—While the primary rainforest grabs most people’s imagination about the Brazilian Amazon Basin, by 2002 this region also was the home for enough secondary forest to fill the entire state of Florida. Yet the value of secondary forest to Amazonian wildlife, including resident and migratory birds, remains poorly understood. Research by Dr. Luke Powell and colleagues focused on birds’ movement rate comparisons between primary and secondary forests. They captured birds along the interface of these forest types. Nine of 10 foraging guilds recovered in 13 to 34 years, whereas terrestrial insectivores—birds that make their living by walking the forest floor looking for insects—took a projected 60 years to recover. Clearly, secondary forests have value for wild birds. On the other hand, if terrestial insectivores may take 60 years to recover, land managers must plan accordingly whether and how management plans might aim to use secondary forest as a corridor for some of the most disturbance-sensitive Amazonian birds. Read the open access article athttp://www.aoucospubs.org/doi/full/10.1525/auk.2013.12202. 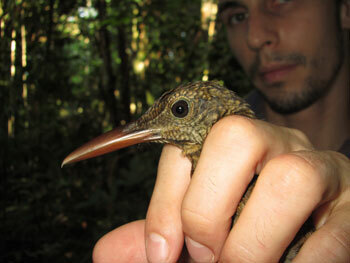 Luke L. Powell, lead author, holding an Amazonina Barred-woodcreeper (Dendrocolaptes certhia), a facultative follower of army ants.